Caspian horses are cute little riding horses that are becoming popular mounts for children. Even though they are small (9-12hh) they are referred to as horses as they are more similar in phenotype (how they look) to horses than ponies. They are reported to be a versatile, hardy and intelligent horse that is biddable and willing to work with people. The breed originated when Louise Firouz sought out ponies for children to ride. She selected the small horses as foundation animals from various herds and locations around Northern Iran with the physical attributes she was looking for. Eventually she started a breeding program and called these horses Caspians because of their original locations near the Caspian Sea. Because of the phenotype of the Caspian they were thought to be descendents of the original small horses in the area who are depicted on historical artifacts and drawings from the time of King Darius, the Persian ruler from 586 to 522 BC. 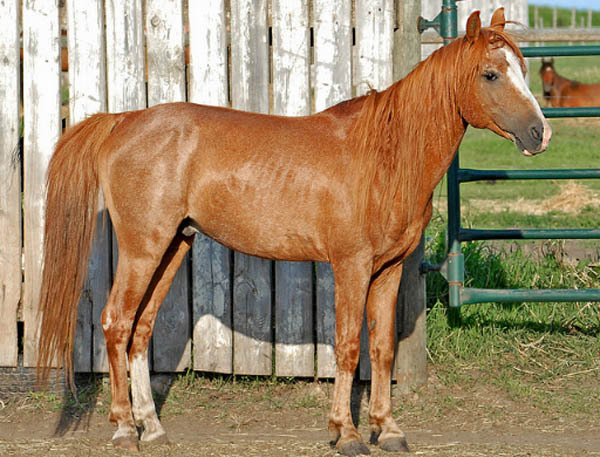 Many believe Caspians to be ancestral to other breeds of horses. It is nice to believe that this new breed is actually directly descended from the foundation stock of the Persian Empire and have managed to remain relatively unaltered genetically. So why are the Caspian horses different and how did they retain their genetic identity for over two thousand years while they mixed freely throughout various herds in Iran? The answer may be that they are not a breed at all, but rather a group defined by a genetic abnormality creating small horses from regular sized horses. This idea is supported by the work of Dr. Ardeshir Nejati of the University of Tehran,a genomic researcher looking at various native Iranian breeds. Horse breeds can generally be classified as a set of individuals with distinct qualities and who produce similar offspring having the same distinct qualities. Inbreeding is consistently defined as an inbreeding coefficient (IBC) of 0.0333 (3.33%) or higher (a 3-3 match). The acceptable cutoff for inbreeding tends to be 0.0667 (6.67%). Linebreeding would be an IBC between 0.018 (1.8%) and 0.0333 (3.33%). Less than 0.018 (1.8%) is considered outbreeding, or a Hybrid. In the paper, “Molecular Marker Genotypes and Measuring their Relationship with Caspian Horses”, they found that extreme heterozygosity existed between the Caspian horses tested, with an inbreeding coefficient of -0.0634 (-6.34%). These numbers indicate that Caspian horses can in fact be considered hybrids, meaning they have a great genetic variance. So even though they look similar (phenotype) they are actually genetically diverse, which makes sense as they were originally collected because of a similar phenotype but from distinct herds throughout the region. Further research may indicate that the phenotypic similarities actually come from a set of genes that cause miniaturization. This is distinct from dwarfism and may be unique to this group of horses. It has been speculated that cross breeding throughout the region could have spread the genetics between the groups. The good news is that the hybridization is beneficial for a population, usually accompanied with both health and performance benefits. Also of interest is that it should be possible to segregate the genes and create small versions of any horse breed. But despite their genetic background, the Caspian horse is becoming more popular as a child’s mount, which is the original purpose tfor which Louise Firouz sought them out.